Why not hold an awareness raising event? This can be specifically regarding liver health or as part of wider health information and awareness focus. The British Liver Trust can provide materials, and also promote your event through our website and social media communications. There is no charge for this assistance but we ask that a British Liver Trust collection box is present at the event for voluntary donations. 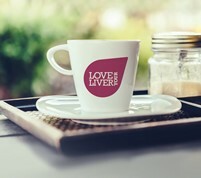 Get involved and support our Love Your Liver campaign by holding a Perk up your Liver! Coffee Break to raise awareness and funds for the charity. Recent research suggests that having a daily coffee may actually be good for your liver! By holding Perk up your Liver! events up and down the country, at home, at work, in hospitals and in the community, we will make more people aware of liver disease and the risk factors, as well as raising vital funds for research and care. Download your Coffee Break event pack today! Contact us to talk about your event requirements and the range of materials available to support you. Email us at loveyourliver@britishlivertrust.org.uk to discuss your plans.